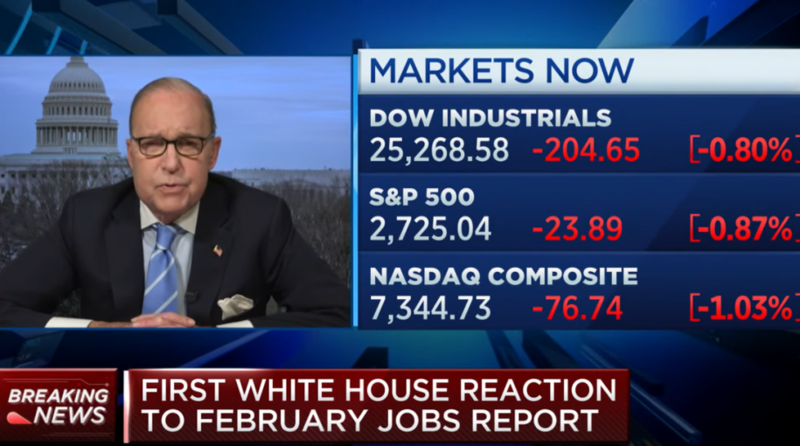 White House Economic Advisor on Jobs Report: Don't Pay "Any Attention to It"
Kudlow’s comments came after the Labor Department said that 20,000 jobs were added in February, falling well below a Dow Jones poll of economists who were expecting 180,000. It marked the weakest month of job creation since September 2017, stoking more fears of a global economic slowdown. The Dow Jones Industrial Average fell as much as 200 points, but pared down its losses to settle for a 128-point decline as of 11:30 a.m. ET. In spite of the latest jobs number, Kudlow did mention that the U.S. economy is still on pace to realize a 3 percent gain. Furthermore, analysts and economists have been quick to point out that government data has been inconsistent since the 35-day shutdown, which delayed the release of data.